Historical aspects of evolution of management of Brain Abscess are described. Importance of the original work of Britt et al (1981) on experimental, neuropathological and CT correlation in Brain abscess management is stressed. 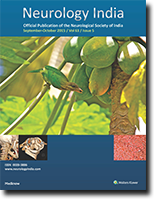 Review of relevant world literature and the Indian experience have been discussed on the management methods in Brain Abscess. Role of non operative treatment and results of operative management in the form of Primary excision, primary aspiration, Secondary excision have been outlined. Author's excellent results with primary aspiration and povidone iodine wash as a new method of Brain Abscess management has been stressed. Forty newly diagnosed, drug naive adult epileptic patients were evaluated for cognitive effects of phenytoin (DPH) and carbamazepine (CBZ). They were randomized into DPH and CBZ groups. Patients with space occupying lesions, progressive degenerative, metabolic and active central nervous system infections were excluded from the study. None of the patients had seizures during the study period. Both the groups were comparable for age, duration as well as type of epilepsy. Full cognitive assessment was carried out using a neuropsychological battery consisting of verbal and performance intelligence, memory, vasomotor function and dysfunction analysis tests before starting the anticonvulsant therapy. The same tests were repeated after 3 months. The mean serum levels of DPH and CBZ at the end of the study period were 19.42 ¤ 4.20 ug/ml and 9.45 ¤ 9.26 ug/ml respectively. The cognitive functions were compared between pre and post study periods in each group and between the two groups. The differences were correlated with serum drug levels. No significant difference in cognitive functioning was noticed in either of the study groups. There was no significant correlation with serum drug levels. It was concluded that both DPH and CBZ have no adverse effects on cognition in adult epileptics with normal therapeutic drug levels. Tests of intelligence and memory and event related potential (P300) latencies were studied in 60 patients with epilepsy and 25 age matched controls. Patients with epilepsy of less than one month duration had impairment on two tests of intelligence (P< 0.05); whereas patients with chronic epilepsy who were seizure free for more than a year and on anti epileptic drugs showed statistically significant impairment on three tests (P < 0.05). The P3 latencies were prolonged in all patients with epilepsy (>2 S.D.) (P < 0.001) as compared to controls. We conducted serial neurological examinations on 50 patients of non-traumatic coma to identify factors predicting recovery. During the course of the study 40 (80 percent) patients died, 1 (2 percent ) survived with sever disability, 3 (6 percent) survived with moderate disability and 6 (12 percent) made good recovery. Status of pupillary and oculocephalic reflex was found to be statistically significant to judge the prognosis. No patient made good recovery when any two brain stem reflexes were absent. Three cases of acute spinal cord trauma developing transient diabetes insipidus are described. The level of spinal injury was cervical in one, cervicodorsal in second, and upper dorsal in the third. Two patients sustained transaction at cervical and dorsal spinal cord while the third had diffuse cordedema and partial neurological injury. In all the cases the onset of diabetes insidious was noted after 3-6 weeks following trauma and it subsided requiring no active treatment. No relevant craniocerebral injury was noted clinically or radiologically. A central medullary descending vasopressin mediated pathway, demonstrated only in experimental animals, may be involved in the spinal cord injury producing diabetes insipidus. A 25 year old female presented with mononeuritis multiplex and pulmonary symptoms. Investigations revealed the presence of marked peripheral blood eosinophilia. Skin and nerve biopsies were consistent with a diagnosis of Churg Strauss Syndrome. These were characterized by vasculitis of the small arteries and veins and perivascular eosinophilic infiltrates. The patient showed good response to cyclophosphamide and steroids. We report three cases of gunshot injuries of the brain, all sustained in civilian life - one suicidal, one parasuicidal and one accidental in a riot situation. One proved fatal after a few days while the other two survived and had the lodged bullet removed successfully. All the three showed varying degrees of migration of the bullet inside the brain. The features are presented in detail and the relevant literature regarding wound ballistics and the mechanism of migration of the bullet inside the brain as also its ultimate restriction reviewed along with the implications for their management including the acceptable indications for their surgical removed.